The following flyer was made with the consent of my friend, C, who was brave enough to out himself on the line for the cause, more than most anyone else would ever do..
First, check out this video of a leading AZ legislator calling for an inquiry into the running of the AZ Department of Corrections. Now is the time for us to organize and show our strength, and hit the legislature hard with support for them to follow up. Contact KPNX, please, after you watch Tony Lester die, and thank them for covering it. Thank Wendy Halloran in particular for being so persistent and giving Tony's family a voice and a glimmer of justice -she got an Emmy for the series on Tony's death. Please Email those remarks to connect@ad.gannett.com. We need them to do in-depth investigations into the larger issue of violence and despair and mismanagement in AZ prisons. That's how we get them to do so. 1. 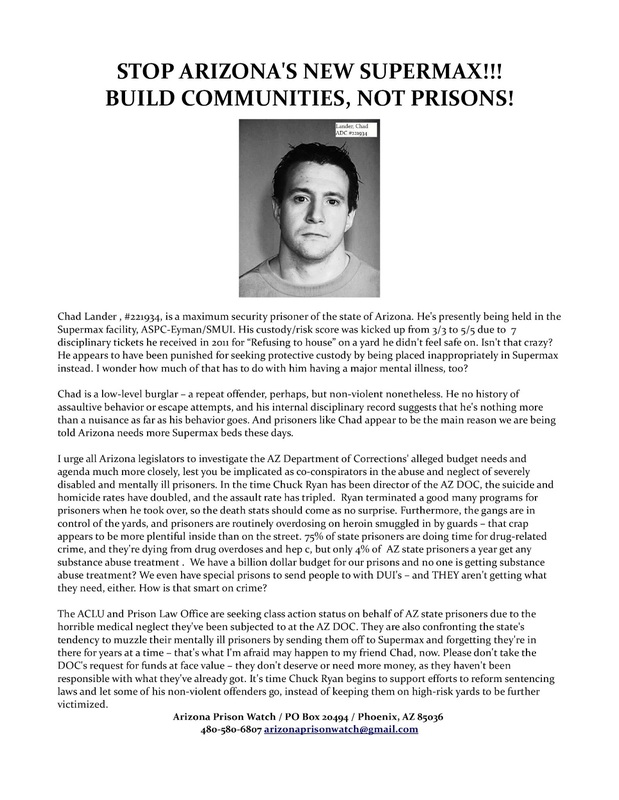 Click here or on the flier above for good talking points on why we DON'T need 500 more Supermax beds in AZ. If we're going to invest some $25,000 per year in housing people who really need psychiatric care and basic support, let's give them housing and services in the community, not warehouse them in prisons where they are simply being neglected and repeatedly victimized. Furthermore, the DOC is being sued in a class action, Parsons v Ryan, for putting too many mentally ill people inappropriately into the current Supermax prison, ASPC-Eyman, and NOT providing them with the psychiatric care they need. 2. 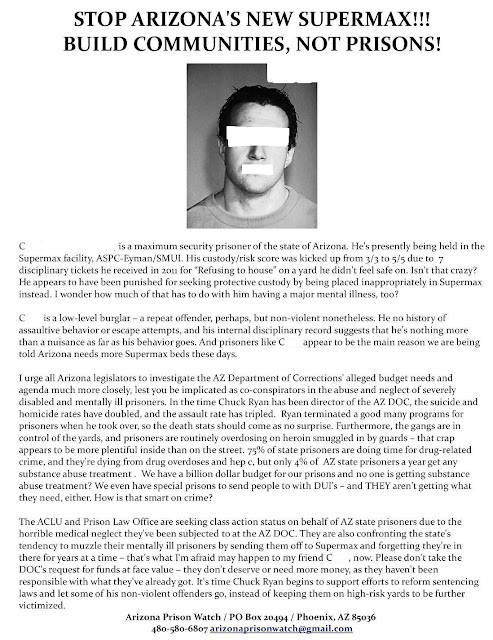 Please go find your AZ state legislator (and the one in the district your loved one's prison is in), and email your objections to the 50 million dollars being spent to build a Supermax yard at Lewis. Tell them our communities need that money more to treat mental illness and drug addiction and keep more people from being inappropriately criminalized. Be sure to put the AZ House Minority and Majority Leaders (Chad Campbell and David Gowan) in your email to your own legislator. Make it clear you expect them all to work together to open hearings into the running of the DOC under Charles Ryan - from the doubling of the homicide and suicide rates to the decision to increase incarceration instead of supporting sentencing reforms as a way of coping with over-crowding, his leadership has been bad for Arizona. Evidence-based practice (use that term) in corrections isn't a partisan issue - the DOC has a responsibility to return their prisoners to the community in batter shape than they got them in, otherwise they set them up to re-offend. That means the Director needs to be current in his profession - Charles Ryan is a relic of an abusive past at the DOC. If you are a former prisoner or a family member, ask to be involved and informed of hearings so you can offer testimony, if you have some to give. That tells them you expect them to follow through with this. Please send me (Peggy Plews at arizonaprisonwatch@gmail.com) a cc of your email to your legislator, and their response, if you get one, with permission to publish it - you and your loved ones can remain anonymous, if you wish. We need to put prisoners' families narratives on the internet for others to find - and if your letters are disseminated widely, the recipients kind of have to respond, since they have more than you in their audience.